With a series of storms set to bring badly-needed snow to the Tahoe Basin, it's important to remember the dangers of navigating the region's slippery slopes. Don't be that driver with just a tiny portion of defrosted glass. Scrape all the windows from front to back. And for goodness sake, do NOT be that person flying around with a 2 feet of snow still clinging to the top of your car, ready to fly off at any sudden stop. Make sure your brakes, windshield wipers, defroster, heater and exhaust system are in top condition. Check your antifreeze and be ready for colder temperatures. You may need to add concentrated windshield washer fluid to the windshield washer fluid reservoir to prevent an icy windshield. Make sure they are properly inflated and the tread is in good condition. Make sure they are the proper size for your tires and are in working order. You might want to take along a flashlight, chain repair links and gloves. Chains must be installed on the drive wheels. Make sure you know if your vehicle is front or rear-wheel drive. Other suggested items to carry in your car are an ice scraper or commercial de-icer, a broom for brushing snow off your car, a shovel to free your car if it is "snowed in", sand or burlap for traction if your wheels should become mired in snow and an old towel to clean your hands. It is also a good idea to take along water, food, warm blankets and extra clothing. A lengthy delay will make you glad you have them. Weather conditions may warrant detouring traffic from the main roadway. It is strongly suggested that drivers always keep an updated map containing the areas of travel. If you have a mobile phone, pre-load the Caltrans or NDOT phone numbers for convenient, updated road conditions, or download their app. Put an extra car key in your pocket. 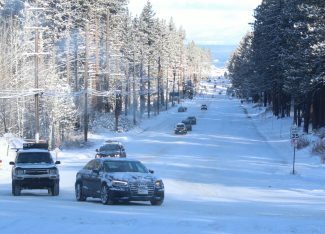 A number of motorists have locked themselves out of their cars when putting on chains and at ski areas. © 2019 Northern Nevada Regional MLS,Inc. All rights reserved. The data relating to real estate for sale on this web site comes in part from the Broker Reciprocitysm Program of the Northern Nevada Regional MLS, Inc. Real estate listings held by brokerage firms other than CENTURY 21 At Tahoe Paradise are marked with the Broker Reciprocitysm logo or the Broker Reciprocitysm thumbnail logo and detailed information about them includes the name of the listing brokers. The broker providing these data believes them to be correct, but advises interested parties to confirm them before relying on them in a purchase decision. Information last updated on 2019-04-23 19:18:28.